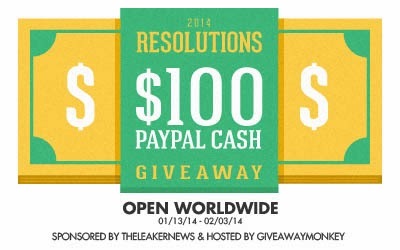 Welcome to $100 Paypal Cash 2014 Resolutions Giveaway – Sponsored by The Leaker News and Hosted by Giveaway Monkey together with BloggieAway and Parenting Patch. It’s that time of year again. Time for us to make a list of Resolutions that we will probably forget about by February. I already made mine and I am sure you have read all about them by now! ;) It is tradition so go ahead and make them if you haven’t already!